And we’re not alone with our obsessions. According to eMarketer, the number of smartphone users worldwide will surpass 2 billion this year and Gartner, a technology research firm, estimated that in 2015, a staggering 1.9 billion cell phones were purchased. While these numbers alone are already astonishing, these statistics only reflect mobile phones. If you add to that our ongoing need to replace our TVs, laptops and tablets, we’re left with an enormous amount of electronic waste (e-waste) that needs to be disposed of. According to the United Nations Environment Programme, up to 90% of the world’s electronic waste is illegally traded or dumped each year. That number equated to roughly 42 million tons of e-waste in 2014 and could top 50 million by 2017! The good news is that the amount of e-waste we’re generating can be prevented through proper disposal and recycling of our old electronics. Modern technology has made it possible to recover and reuse many of the materials that make up our electronic devices. Apple alone recovered $40 million worth of gold in 2015, along with $6 million worth of copper through its recycling program. Granted, we’re probably not going to be enjoying the same kind of financial reward with our own recycling efforts, but we can still do our part to make sure that we dispose of our electronics responsibly and divert as much from landfill as possible. Our staff here at City Waste Services all share this mindset and ensure that we separate as much e-waste for recycling and reuse whenever we find it in our garbage bin rentals. We may have billions of phones, but we only have one Earth. 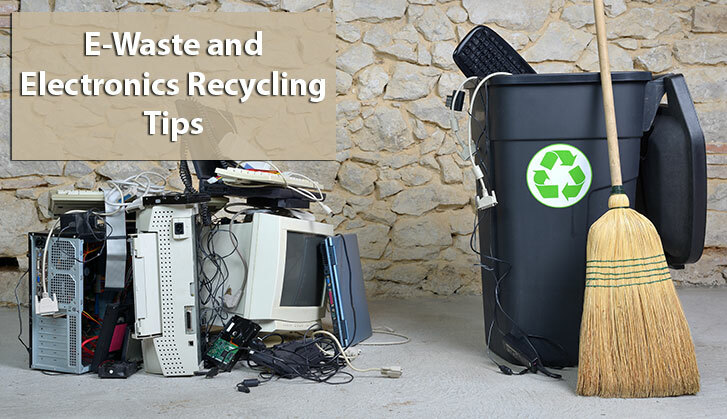 Now before you rush off all bright eyed and bushy tailed to your nearest recycling depot with all your old electronics in tow, make sure to set aside any devices that store personal information. You should wipe these devices clean of your sensitive data. That’s usually not as simple as just deleting photos or factory resetting your mobile phone or tablet. More details on the safe removal of personal data off mobile phones and tablets can be found here. If you’re disposing of computers or laptops rather than phones or tablets, this information about erasing sensitive data off computer hard drives will probably be more suitable. Once you’re done securing your personal data, here are some options for disposal. Most municipalities have recycling depots for electronics and hazardous waste. Information about Toronto’s electronics recycling drop off depot can be found here. If you don’t live in Toronto, check your municipality’s website for more information and for drop off locations near you. The EPRA states that they keep the equivalent of 20,000 elephants’ weight of electronics out of landfills every year! If you live in Ontario, the website of the Ontario Electronic Stewardship (OES) at recycleyourelectronics.ca is a great resource for help in finding even more drop off locations for your old electronics. Other provinces’ e-waste recycling programs are also available on their website for those live elsewhere in Canada. For more information about the different e-waste programs available across the country you can also visit the website of the Electronic Products Recycling Association (EPRA) at epra.ca. The EPRA states that they keep the equivalent of 20,000 elephants’ weight of electronics out of landfills every year! From time to time, most cities and towns also have sponsored recycling collection events for your unwanted electronics. These are usually held at community centres and libraries, which makes recycling even more accessible. A list of e-waste recycling event dates, for example, can be found here for Markham and here for Toronto. If you’re an early adopter and purchase the latest gadgets as soon as they’re launched, you probably have a ton of unused electronics that are still in working condition (and probably newer than ours!). Since they’re still working, it makes more sense to donate these devices so that someone else can put them to use. Local schools, community centres and senior organizations are a good place to start looking for a place to re-purpose your hardware. It’s reassuring to see the amount of responsible retailers and manufacturers that are leading the way to help divert enormous amounts of e-waste from landfills. Almost all the major manufacturers and many big box stores have programs in place to take your old electronics. Check with your local store or device’s manufacturer to find out where you can bring or send your devices back to. The following are just a sampling of retailers and manufacturers’ recycling programs in Canada. Apple accepts many of their old devices online or in-store. You may even be eligible for a gift card in return depending on the age of the device. If you are, we’re expecting a finders fee! Dell makes it extremely easy by either offering you the free recycling option when you purchase your product, or with free pick up of old computer equipment at your home (via Purolator). Best Buy partners with eCycle solutions and Call2Recycle to collect your unused electronics and batteries at their stores, regardless of where you originally purchase them. Staples also partners with eCycle solutions and accepts batteries and most of your old hardware for recycling. With so many options to dispose of your old electronics responsibly, there really isn’t any reason to be sending so much e-waste to landfills every year. Next time you’re organizing your basement and put your old gadgets in the “trash” pile, try instead to think green and move it to the “donate” pile.